June 23, 2011 | Comments Off on Free Five-Course Dinner? No Thanks! Free Five-Course Dinner? No Thanks! Even if this was real, I don’t think anyone in their right mind would want a five-course dinner from McDonald’s. 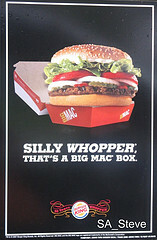 Clever, Burger King, Very Clever Originally uploaded by SA_Steve If the whopper is so good…how come they ate the Big Mac first?